National Bundt Cake Day, Ahh YUM! The word “sugar” is a part of our brand, people! With it being National Bundt Cake Day (November 15th), we found this as the perfect opportunity to rave about one of the best and most tasty experiences Sugar Fix Dental Loft has ever encountered. The entire team had the absolute pleasure of experiencing Nothing Bundt Cakes for the first time ever. 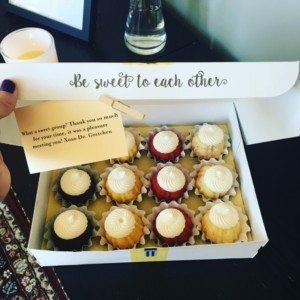 A couple of weeks ago, we were blessed to have one of our fellow dental offices gift us with this delicious tasty treat. It was hand-delivered, by one of the owners and he was extremely kind and informative. Our box was filled with the flavors of red velvet, lemon, and chocolate chip. The cream cheese and butter frosting is out of this world and literally melts in your mouth. The entire office melted once they tried these all of these cakes. My personal favorite, was the lemon. Of course, Dr. Jessica Emery is all about supporting local businesses as a local business owner herself. Nothing Bundt Cakes is located at 1953 N. Clybourn Avenue with a second location on opening soon! We have already used this company for multiple other gifts to our colleagues and friends. Our office manager, Nicole, even placed a call to the owner the next day to tell him just how fabulous his cakes were! With the holidays quickly approaching, all of us here at Sugar Fix highly recommend using this fabulous local business to spread the deliciousness throughout the city. Not to mention, these cakes would compliment any Thanksgiving table. Take our word for it, we know our sugar!! ? Gorgeous (and delicious) little cakes! Lastly, a very special and sincere “Thank You” to Dr. Gretchen Ferraro at Sweet Tooth Dental for this amazing gift that not only keeps on giving but keeps us wanting more!